Tennis elbow, or lateral epicondylitis, is a common injury where pain is felt on the outer elbow. The injury is not necessarily sustained from playing tennis, but is so named because it is commonly felt in tennis players due to the backhand swing. 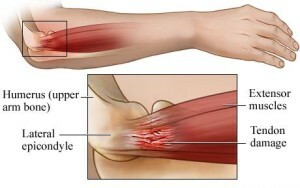 The injury typically occurs with overuse of the arms, forearms, and hand, which then cause a tear in the lateral epicondyle (the bony part on the outside of the arm). The tearing of the tendon can cause a significant pain response. The pain is usually felt with any shaking or squeezing motions of the affected arm. How does Acupuncture and Chinese Medicine help treat tennis elbow? The tendons of the body have a lower amount of blood circulation compared with the larger muscle groups. This decreased circulation directly affects the elasticity and healing promotion of the tendon. By stimulating the local area with very thin acupuncture needles, we are able to effectively increase the circulation of blood to the tendon. This, in turn will allow the anti-inflammatory actions of blood to decrease the swelling, as well as allow the platelets to heal the local area. Also, by working on the extensor muscles attached to the lateral epicondyle (extensor carpi radialis brevis) in order to relax the muscle, it will help to decrease the stress felt upon it’s corresponding tendon attachment. A typical course of treatment is two treatments a week for four weeks. However, individuals are met with on a case-by-case basis and better recommendations can be given once the patient has been seen. If you or a friend suffers from tennis elbow, please contact our office to find out if acupuncture is right for you.